This narrated video demonstrates an anterior approach levator advance procedure for the correction of congenital ptosis. It discusses relevant aspects of the anatomy of the levator muscle as well as skin crease reformation. A blepharoplasty is not being undertaken as there is no skin redundancy. A high temperature cautery or hot wire is being used for dissection. The tarsal plate is exposed. Identifying the dissection plane to the tarsal plate can be more difficult with the cautery than scissors, but the haemostatic effect is a big advantage. If the skin and orbicularis are grasped and retracted inferiorly and away from the globe, one can usually see a small pucker deep to the orbicularis, through where dissection will lead to the tarsal plate. Dissection at the lower end of septum exposes the inferior end of the levator aponeurosis. This is inferior to the pre-aponeurotic fat pad which although a useful landmark for ptosis surgery does not need to be exposed to identify the inferior end of the aponeurosis. The posterior surface of the retractors is dissected free from the underlying conjunctiva. One can either dissect between levator and Mullers to create a levator flap or between Mullers and conjunctiva to create a flap consisting of both retractors. While there is no evidence to guide the choice, intuitively it seems prudent to use both retractors in congenital ptoses given the reduced levator function and sometimes a levator only flap does not appear to adequately elevate the lid. Similarly the medial horn which passes over superior oblique tendon and attaches to the posterior portion of the medial canthal tendon and the posterior lacrimal crest, is partially transected. A quick check of the lid contour and the position of its peak aids suture placement. A double ended 6-0 vicryl suture is passed partially thickness in the tarsal plate. The lid is everted to ensure it is not full thickness. Each of the two needles is passed from the posterior to the anterior surface of the levator. The suture is tied on a bow and the lid position checked. The lid is marginally too high. The sutures are placed a couple of millimetres lower on the levator aponeurosis. The lid position is better. The levator has not been advanced a huge amount and just a small amount of its terminal end and adjoining orbicularis is resected. This patient had no skin crease on this side. In this case, the orbicularis of the inferior incision edge is being sutured to the terminal end of the levator aponeurosis in a few places. This is thought to create a soft or less dense skin crease. This contrasts with the more widely used technique in Caucasian eyes of including a small bite of levator in the skin closure. There is very limited evidence for different skin crease reformation techniques and their outcomes in Caucasian eyes, but there are theoretical downsides to including levator in the skin closure. 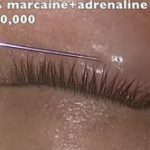 Firstly it may be at greater risk of slipping with resultant loss of the skin crease or change in its position because of the repeated pull on the closure from blinking. Secondly it is contrary to usual surgical teaching to include some internal tissues between skin edges. Finally, electron microscopy studies have questioned whether there are indeed slips of levator that attach to skin. The skin is closed with a running 6-0 suture.